“Puppy dog eyes” is one of the most mainstream expressions that we hear in our day-to-day lives. Its origins trace back to our furry friends (i.e. pet dogs). There’s a reason that dogs are referred to as man’s best friend—it goes back over 15,000 years. Despite the commonality shared between social beings, it is a known fact that dogs have been our lifesavers since the beginning of time. We exist in a very symbiotic relationship whereby they keep us sane, while we have domesticated them to the point that their lives and health depend upon us entirely. This shift in roles is to the point that now we are their guardians and their object of devotion. These loyal creatures, in return for their unabashed adoration, require from us only food, shelter, affection, and attention. Above all, dogs are a source of therapeutic comfort for us. They are proud owners of those strong forelegs that accompany us on our tiresome runs. Moreover, dogs are the warriors that protect our home. They are also a part of our police task force, as well as our emotional support systems such as therapy dogs. Finally, they provide a warm paw to grab on to when we need to find solace. Therefore, it falls upon us to hold our end of the bargain too. Furbo saw the heart-wrenching bombardment of emotions that both humans and dogs underwent whenever faced with the possibility of separation. The separation anxiety experienced by both pets and pet owners is indeed an endemic that Furbo saw to cure. So, it got to work on a product line exclusively for our canine buddies. Furbo, along with animal behavior analysts, conducted numerous research studies that proved separation anxiety to be a two-way street. It proved that 20 to 40 percent of dogs analyzed by veterinary behavior specialists suffered from this behavior disorder. Both parties experience emotional distress from each other’s absence, which, in turn, causes this malady to surface. The ambiguity of their actions in our absence urged the pet industry to get creative. Alongside their phenomenal gadget, they offer a holistic value-added package. In fact, any dissatisfied Furbo customers—should there be any—are granted a 30-day grace period. Simply put, this period starts from the time at which the customer received the Furbo until return or exchange. They provide free two-day national and international shipping. Also, starting from the shipping date, they include a one-year warranty. The warrant does come with conditions that dictate ineligibility based on the damage that was caused because of repairs done by an unauthorized third party, defects caused by failure to adhere to instructions posted in the instruction manual, liquid contact damage, and impairment via vandalism. Moreover, their 24-hour Support Team is always at the customer’s disposal. Not only have they constructed a blog to create an interactive exchange platform with their valued customers; they’ve also attached with their FAQs as well as content relevant video tutorials. All of this is to help you every step of the way. Tomofun, a multinational pet technology startup (Seattle 2014), established by Victor Chang embarked upon the tedious mission to dismiss our ailment and nip it in the bud once and for all. They took it upon themselves to reach out to professional dog trainers as well as researchers for the purpose of engineering an all-encompassing camera to satisfy pet parents. The idea was born in June 2014. Then, in July 2014, the concept itself was put to test and thorough market research was conducted. Finally, December 2014 brought the unearthing of their first 3D printed prototype. The inauguration of Furbo took place in April 2016 via Indiegogo, a crowdfunding campaign. They were able to construct a machine that could arouse (via audiovisual simulators) a canine’s interest in an activated Furbo. This interactive pet camera quickly became a hit. It even turned into one of the most rapidly growing Crowdfund campaign candidates to date. They managed to reach and surpass their goal in less than eight hours. With 3,979 backers they raised $511,302, which was a 906% fund victory. How Did Furbo Become Popular? 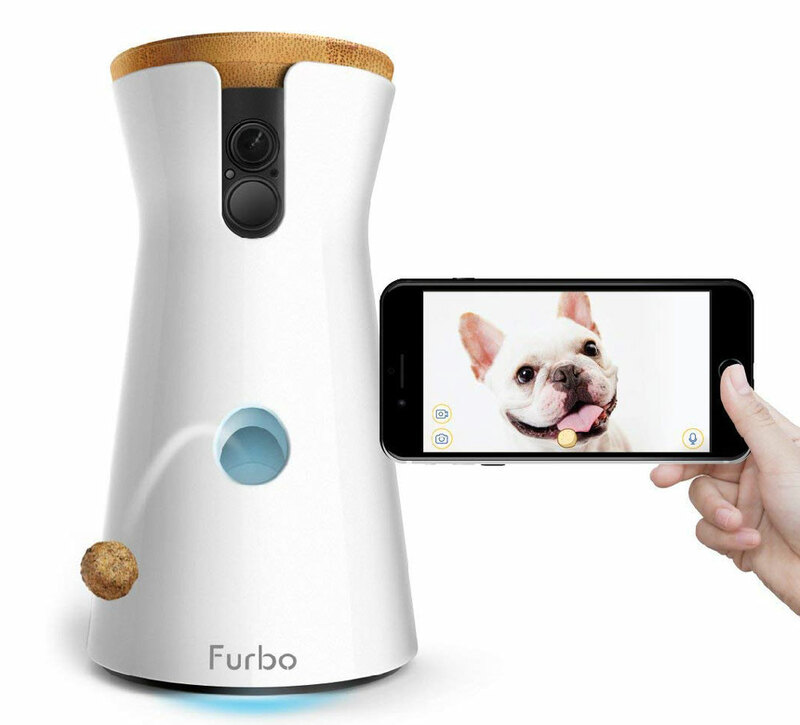 Furbo ($249.00) is famous for its reputation as the world’s best interactive pet camera, treat dispenser, training device, and pet assistant. It received the stamp of approval from The New York Times, The Verge, TechCrunch, The Huffington Post, The Next Web, Popular Mechanics, and even Ellen Degeneres. The list includes countless other credible and renowned sources of public opinion influencers. As a result, it is currently the number one best seller on Amazon. They converted a connective idea into a tangible product. Their aim was to meet the desperate demands of what they deemed as “PawParents” (pet owners) and “FurBabies” (the dogs). The Furbo Interactive pet camera offers the opportunity to build, maintain, and enhance the relationship between you and your pet. They basically gave us the gift of a pet-sitter without the need of having a stranger in your house. To be honest, Furbo is all you want from a sitter, just in technology form. Contrary to other pet cameras, Furbo has been deliberately designed only for dogs. It is a convenient, user-friendly, and practical addition to homes. Furbo is completely doggy-proof and safe from any possibilities of dog-induced mishap. They were able to accomplish this through rigorous research and development experimentation. To test how stable and hardy Furbo was, the company used a large sample of dog participants—varying in breed, size, and temperament. Consequently, they made a highly durable and sturdy camera that could not be knocked over. The camera was virtually indestructible with its bamboo wooden cover. The setup is straightforward and easily graspable. One must begin by removing the 3M double-sided adhesive straps located at the bottom of the Furbo Camera, or the tripod mounting socket. As recommended by Furbo, it should be placed approximately 12–20 inches above the floor. Of course, you can play it by the ear and choose to place it according to the mobility and size of your dog and placement preferences based on the room blueprint. All in all, it’s built on a very sturdy foundation and would take a concentrated destructive effort to destroy. Following this, all that is required is a smartphone and a 2.4 GHz WiFi connection (broadband Internet connection). From the App Store or Google Play, install the phone application on your iPhone or Android. A Furbo account needs to be created (an active Bluetooth connection will be required). After you see the green light on Furbo the synchronization process between your phone and the gizmo will take place in the setup mode. Once the WiFi connection soars, you’re good to go. However, if you struggle, after a third attempt that went wrong, the app automatically messages the Support Team and links you to further assistance. You can even sync it with Alexa or similar AI assistants. 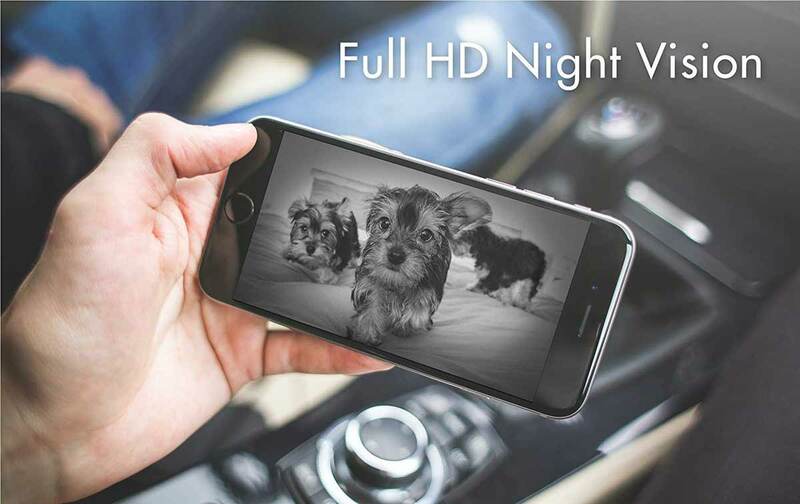 The specifically natural dog sense tailored Furbo Interactive Dog Camera consists of a live stream and recorded supported by a 1080 HD camera, with a 160-degree wide angle lens, Infrared LED night vision and 4* Digital Zoom. The stream quality is adjustable to avoid lags, buffering or low-quality transmissions. Selfies and snapshots from these feeds are at the user’s beck and call. With its Smart Privacy Mode, Furbo automatically shuts off once the owner gets home. This two-way audio providing mechanism involves a built-in microphone and speaker, changeable snack call option, assisted by a high-quality microphone. It has an automatic, customized (to each pet’s sensitivity) barking sensor that transmits a push notification to your smartphone. Lastly, it possesses a treat dispenser which can hold up to 100 round shaped treats. For first-time purchasers, they get you started by distributing a free sample pack of treats. This 2.1-pound device comes along with a guide instruction manual, 2M USB Cable and Furbo Power adapter. Furbo also offers with every new purchase, a cloud service which is a 90-day trial for recording, daily doggy diaries to log in pet journals and smart alerts. Besides, there is a key differentiating strategy of Furbo that sets them apart from their rivals. In brief, it is the genetic build of dogs that they take into consideration. This element makes Furbo product favorable to dogs. This physiological awareness has become a competitive advantage for Furbo. Now, they now have the upper hand via the first mover strategy. Also, dogs are colorblind, although only to a certain degree. Therefore, the only two distinct colors and wavelengths that for them appear in the vivid form, are blue and yellow. 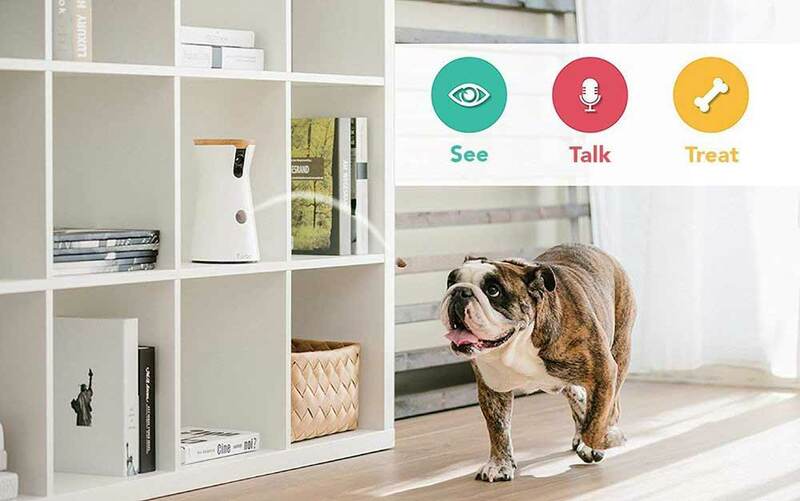 Taking this into account, Furbo’s monitoring camera functions on the premise of lights to toggle their optical receptors and capture the dog’s attention. At first, the dog might be wary or even extremely apprehensive with Furbo. However, upon gaining familiarity and trust, they can reap the benefits of the light indicator. Gradually, the dog will connect the dots and begin to associate the change of the yellow light (Sleep Mode), to the cool blue light (Interactive Mode); as a prerequisite to their owner attempting to initiate contact with them. Simultaneously, it will also activate a light but audible clicking noise. The noise is very similar to that of a professional trainer’s clicking tool, thereby conditioning the dog. Even the method in which the treatment is delivered, perfectly mirror images the activity of playing fetch with your pet. This mock simulation allows for a strong and healthy nurturing of dog-human bonding. 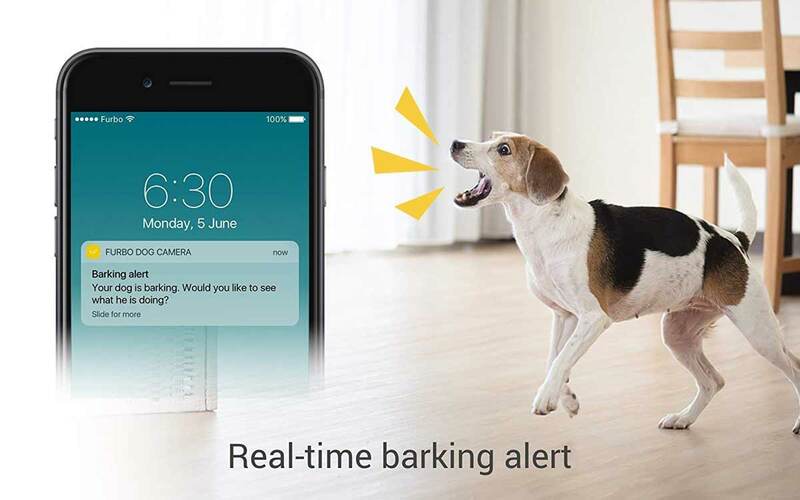 Their barking detector is an ingenious add on, infused with state-of-the-art technology that filters out any background noises or interference of any sort. Hence, it only relays the necessary audio reports back to the owners. This means apart from the calls of distress produced by your dog, your phone will not be busing incessantly. Apart from the obvious technical perks, this wholesome gadget is an instrument for holistic well-being of both you and your dog whilst simultaneously eradicating pet abandonment syndrome. The two-way communication allows you to calm your dogs in times of worry when you aren’t there. It even allows to harmlessly interact with them whenever you deem it appropriate to do so. Multitasking miracles doesn’t stop here. Along with playing with our dogs, this device keeps them entertained and active with shooting treats. These mental and physical stimulation keeps dogs healthy and happy. Furbo can act as a training tool that either reinforces good behavior or inhibits the execution of bad behavior. Puppies are loose cannons in that they need to be trained, monitored, and cared for around the clock. This is especially true at the beginning phase when they have a high dependency and high levels of insecurity, as they will need company. For employed Pawrents, this is going to be a tough hill to conquer. This is where Furbo comes into play. It can reassure your insecure pups that you are there when they hear your soothing voice. You can continually imprint with your puppy when you have constant access to them. Furthermore, in this phase they require guidance. The moment we leave our dogs alone, the amount of mischief and trouble they can get into is highly unpredictable. Hence, Furbo is a training tool that reduces some of the risks and uncertainties. This can be used for both puppies and adult dogs alike. With just a few reprimands and commands, Furbo can facilitate in training your dog to not urinate or defecate in the wrong places, not to chew on furniture, bark incessantly, climb on furniture, etc. It can reward our pets with treats shooting out of it. The health and safety of dogs is the top priority of any pet parent. Whether it is old dogs that need more monitoring naughty, vulnerable puppies, or mature dogs, they can all fall victim to unforeseen problems. Most frequently reported as a problem is that we tend to miss or overlook signs of illness in our dogs. This is because we are either not there to observe covertly displayed behaviors or because dogs hide symptoms well. Either way, with a 24-hour functioning camera, one can observe appetite fluctuations, energy level changes, erratic behavior, signs of suffering, or any possible emergency circumstances before it’s too late. Accordingly, precautions can be taken to ensure their wellbeing. Furbo thus proves to be a long-term investment that’ll elongate our dog’s lifespans. In addition, it will reduce medical veterinarian bills and alleviate the pet owner's strains. Furbo links up with Facebook, Instagram, Twitter, Snapchat, and numerous SNS platforms to allow its users to take and share images or videos of their dogs. They even have a Family Account feature. There is always room for improvement and Furbo is no exception. First, each Furbo unit can only have two people connected at a time and only one email address linked to it. Second, unless your Wi-Fi connection is always strong (minimum 0.8 Mbps) and steady, the audio quality will fall through and lag. In addition, there’s no way to initially disable the audio when installing the application. One must first mute the smartphone or risk startling their pet; this is an unnecessary hassle. If you use the higher resolution setting, this slows down the connection and often the sound does not come through. By limiting the application to only iPhone and Android users, Furbo is completely disregarding a huge segment of the population. This may lead to losing out on a lot of potential customers. It always requires that the phone systems be up to date. Additionally, the food dispenser has been known to get jammed unless you use the specifically recommended treats. Even the bark alert has gained the stigma of being too sensitive and at times picking up too many other noises. What to be Careful of? It has no battery option which means it will always need to be connected to an electrical outlet. Consequently, limiting your options as to where to place it. Moreover, it does not have a backup battery. Hence, in case of a power outage, you will lose the connection and both the pet and owner would have to fend for themselves in the dark. There is also an underlying risk with the copycat version of fetch that it provides. With treats shooting out decent velocity, one cannot rule out the possibility that it may end up in the eye of the dog, potentially impairing their vision or even lodging in their throat ending up being a choking hazard. Moreover, it does not allow you to control the aim of the treats. Also, the device produces a loud, jarring, mechanical voice when launching the treat. The noise can startle dogs who are new to it and may add extra emotional dissonance for the dog. 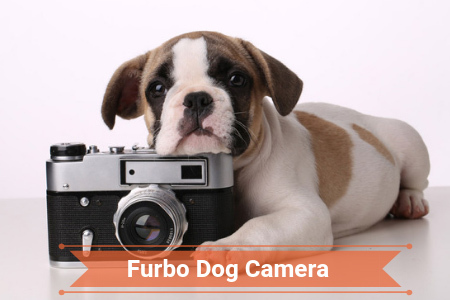 Unlike most other pet cameras, Furbo offers little to no flexibility with its camera manipulation options. While it is easy to use, the camera is not adjustable to either pan or tilt, limiting the field of vision that the camera can cover. Finally, unlike other pet cameras, with Furbo you will have to manually take a picture or record the video after opening the app. Usually, other pet cameras record constantly. 1.0.3 How Did Furbo Become Popular? 1.1 What's in the Box? 1.6 What to be Careful of?